The Radford Ezy Net Limited system of synthetic surface, artificial surface or astro turf surfaces for sports provide the opportunity for schools, local authorities, sports clubs and other organisations to benefit from a safe, slip resistant yet responsive playing surface that can be used virtually all the year round and almost immediately after heavy rainfall. The materials we use are highly resistant to weathering and the effects of UV radiation. Each play area is individually designed and constructed according to the site conditions established during a survey and to the client’s budgetary and safety requirements. Impact response and stability tests have been carried out that confirm relevant standards are achieved. The method of construction can be either an engineered tarmac or a dynamic sub base of clean graded stone, this is additionally supported by strong geotextile separators thus preventing the infiltration of fines into the sub-base which can lead to the distortion of the level profile. A suitable sports carpet is laid on top of our shock pad and drainage layer (a 3-dimensional core bonded between two non-woven geotextives). Site conditions will always determine the appropriate materials to be used in each project. A full range of technical specifications and test results are available for all our products. We offer the complete service from planning through to commissioning using our own approved contractors. 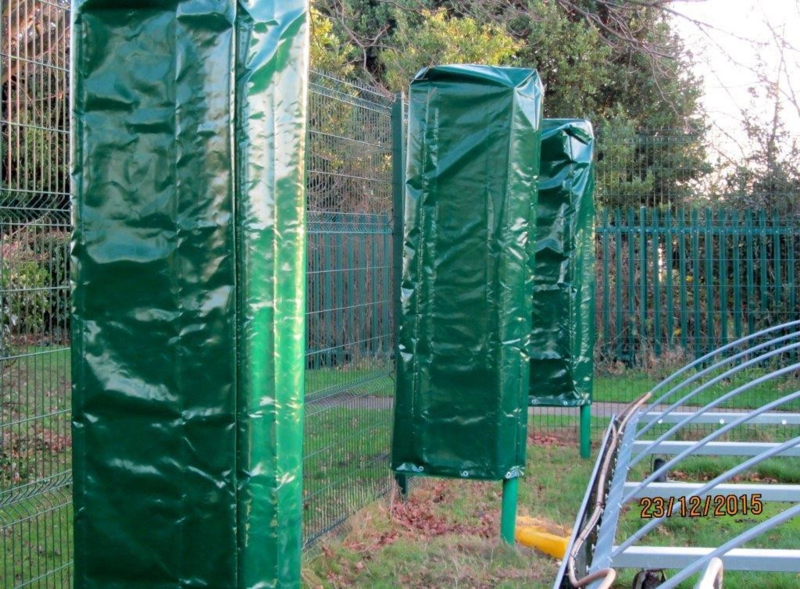 Protect the metal storage boxes from the elements and stop vandalism: Radford Ezy Net offers a waterproof canvas bag to cover the boxes. These slip over the boxes and have eyelets at the base to lock off. Please make contact should you be interested in the products. Permaline is so easy to install and it’s environment friendly too. 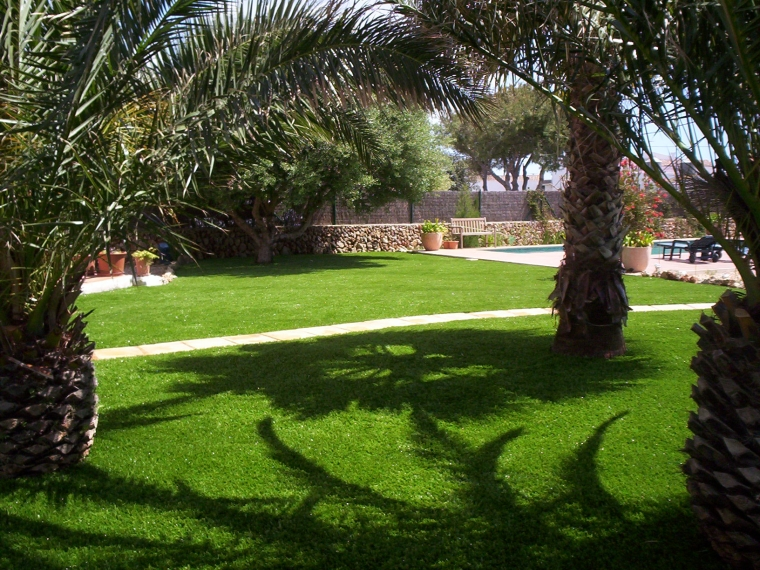 Natural grass grows right into Permaline and actually anchors it permanently into place. It’s safe for players yet exceedingly durable. Permaline has proven itself again and again in many locations with superior quality that withstands the test of time with an estimated lifetime of 10-15 years or more. PliFix is a synthetic grass implant used for marking and locating various items and measurements. Once set into the ground, PliFix helps to indicate buried objects (tanks, irrigation systems and cables), show ground hazards and mark out building sites, camp sites etc. When used on sports areas they provide an ideal may to mark positions on the playing surface with Plifix clearly visible in the grass. 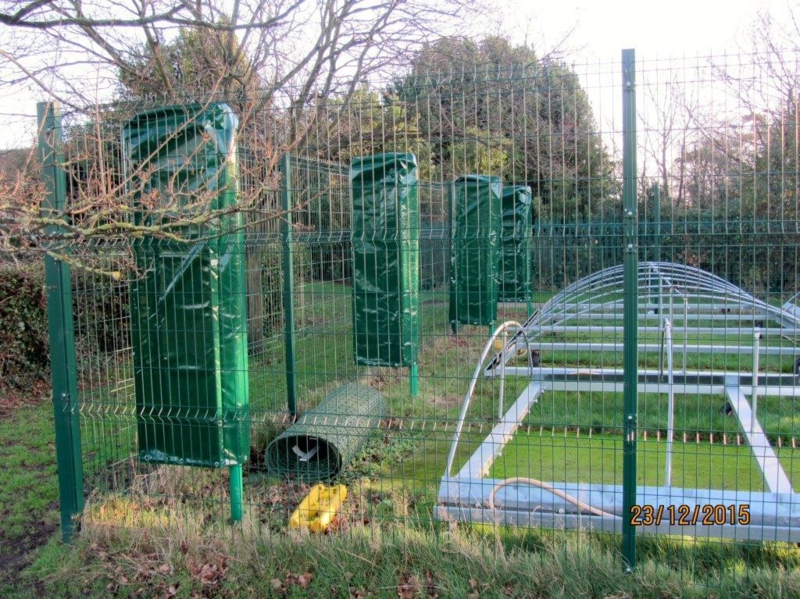 Due to their design, Plifix can either be left in the ground permanently or moved as and when required. PliFix provide an excellent way for groundsman to mark areas and were even used on the pitches at the 2007 Rugby World Cup in France. PliFix markers are placed in the ground to a pre-determined depth so that their coloured synthetic grass tops remain visible. When the grass is next cut these also get trimmed to the correct level. This means that although still clearly visible they remain equal with the length of the grass. How can PliFix be used? Different colour options allow you to clearly differentiate between different types of markers. For example white for field markings, blue for sprinkler heads or red for electricity. 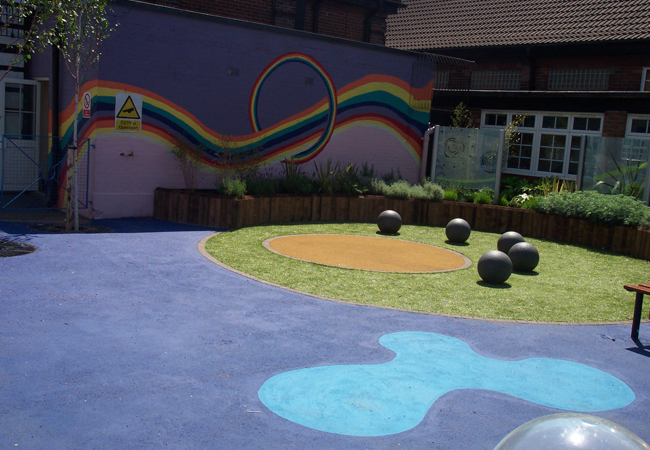 Rubaflex is a seamless insitu laid porous wetpour rubber safety surface, ideal for playgrounds and smaller sports areas. The surface constructed of EPDM rubber granules offers considerably higher wear characteristics than reclaimed SBR rubber. With a wide range of colours available the construction of attractive patterns and logos is possible, giving added play value and interest. Use of only quality rubbers and binders, combined with experienced installers using tried and tested methods, ensures a quality, lasting product. Rubaflex can be laid directly onto new or existing bitmac or concrete surfaces or at depths over 40 mm onto compacted MOT Type 1. Ramped edges can be formed down to existing levels where necessary. With a range of thicknesses from 15 mm various Critical Fall Heights to suit the equipment or use are available. 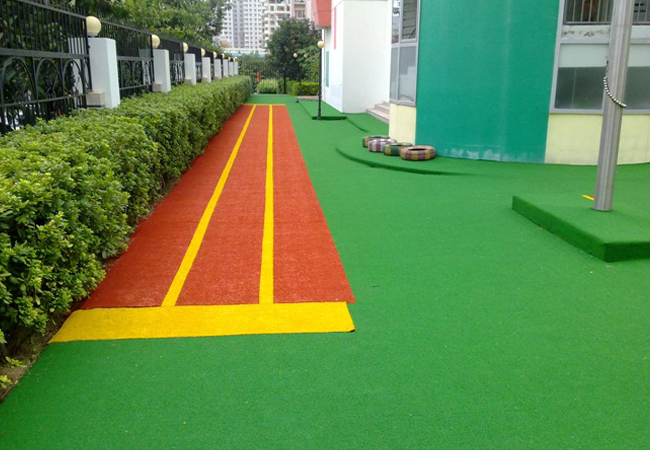 This versatile and attractive surface provides an economic alternative to conventional rubber tiles or wetpour. The soft and springy feel is friendly and inviting and has proved to be of added play value in itself. It comprises one or more layers of recycled impact absorbing polyethylene foam matting, covered by a sandfilled artificial grass carpet. The matting is made of waste, polyethylene foam, which is chipped and heat bonded (no adhesives) to form a durable, free draining and highly effective impact absorbing material. The foam’s closed cell construction utilises trapped cells of air to produce a springy, cushioned surface which does not compress, even after prolong. 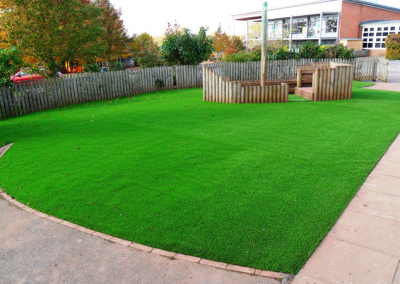 The sandfilled artificial grass surface is hard wearing, resistant to cutting and burning (classified as low radius of ignition according to BS 4790) non-slip and is both attractive and natural looking. Alternative colours and patterns are available if required. The flexible nature of the materials enables it to be installed to suit the natural contours of the surrounding areas. 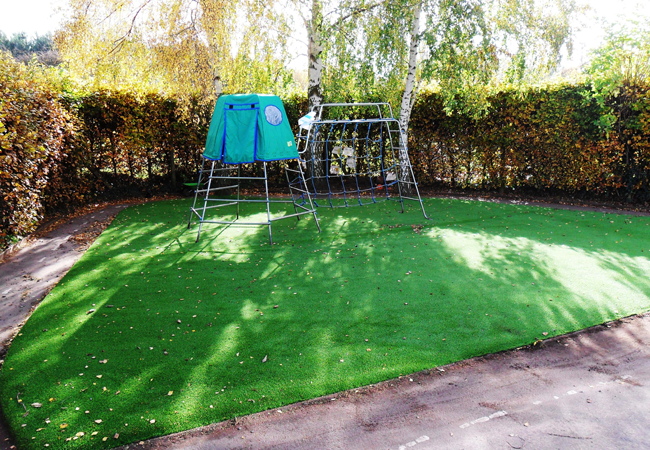 The versatility of the system enables the formation of traditional playgrounds, small kickabout, or general play areas (without equipment) with no need for a base. (subject to suitable ground conditions). Maintenance involves sweeping to keep clear of debris and dirt, (hosing down if preferred) and topping up with silver sand annually. Repairs can be undertaken quickly and easily should they be necessary. The Radford™ Ezy Net™ Limited (Ezy Net™) system of synthetic surface, artificial surface or astro turf surfaces for sports provide the opportunity for schools, local authorities, sports clubs and other organisations to benefit from a safe, slip resistant yet responsive playing surface that can be used virtually all the year round and almost immediately after heavy rainfall. A truly improved playing area. Radford™ Ezy Net™ Limited surfaces ensure sustainable shock absorption characteristics. The synthetic surface, artificial surface or astro turf will maintain even levels and resist movement in the playing surface. They provide the ideal playing characteristics under a very wide range of temperature and humidity conditions. Impact response and stability tests have been carried out that confirm relevant standards are achieved. The method of construction can be either an engineered tarmac or a dynamic sub base of clean graded stone, this is additionally supported by strong geotextile separators thus preventing the infiltration of fines into the sub-base which can lead to the distortion of the level profile. A complete range of sand-filled, rubber-filled, water-based and variations of carpets are available, suitable for hockey, football, tennis, bowls, cricket and multisport. Various polypropylene and nylon yarns with different properties and play characteristics are used to manufacture the carpets. The synthetic surface, artificial surface or astro turf are laid onto foundations consisting of geotextiles, sub-base and engineered base layers and shockpads, giving pitches strength, stability, porosity, longevity and resilience. Synthetic surface, artificial surface or astro turf pitches incur lower maintenance costs than conventional turf. Our shock pads minimise the risk of injury and impart much less stress on the players, coaches and officials. 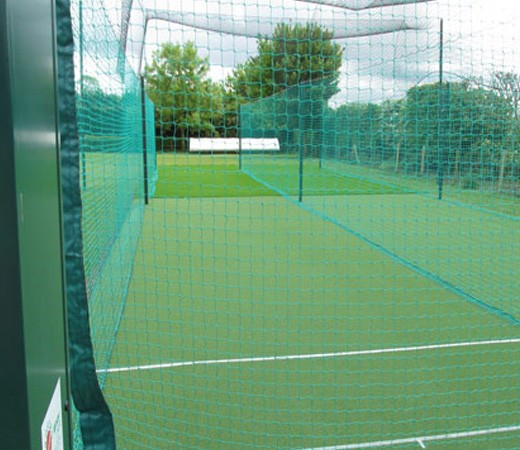 Ezy Net™ tailor made synthetic surfaces are designed either to maximise the number of activities that can be played upon them or to be used quite specifically for only one sport. Radford™ Ezy Net™ Limited synthetic multi-sport surfaces are indiviually designed and constructed to emulate as near as possible a good natural turf surface whilst meeting the high standards demanded for safe and successful sport in the 21st century. By involving Radford™ Ezy Net™ Limited at the earliest stage we can help you with the planning, design and construction to ensure you get the most economical, reactive and long lasting synthetic surface. Call direct for a no obligation, on site consultation. 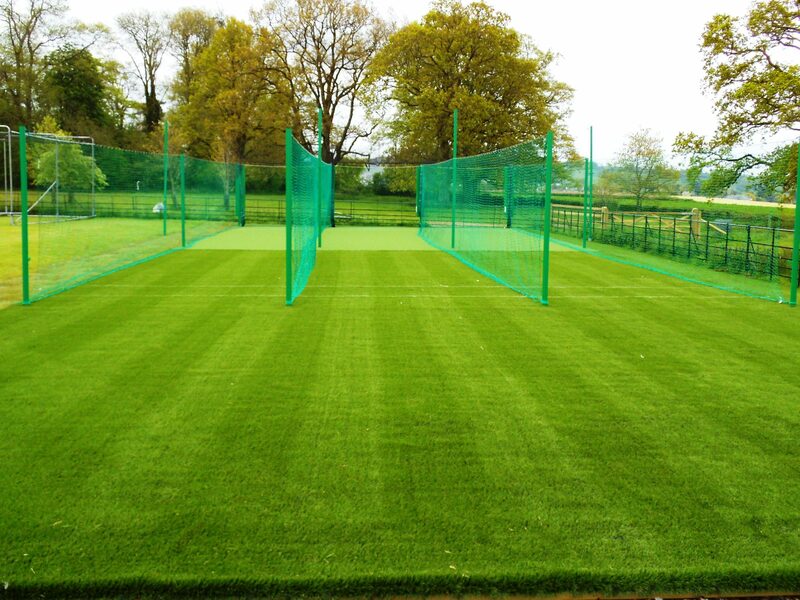 For affordable, bespoke, multi-sport playing surfaces the solution is the Ezy Net™ Dynamic Playing Surface. The materials we use are highly resistant to weathering and the effects of UV radiation. Each play area is individually designed and constructed according to the site conditions established during a survey and to the client’s budgetary and safety requirements. With a Radford™ Ezy Net™ playground it is possible to have serious fun and take safety seriously. Radford™ Ezy Net™ provides a safety surface that is specifically designed to take the risk out of playgrounds. It is made to last through years of carefree childrens’ play. It has a hard wearing surface which is easy to clean and maintain. 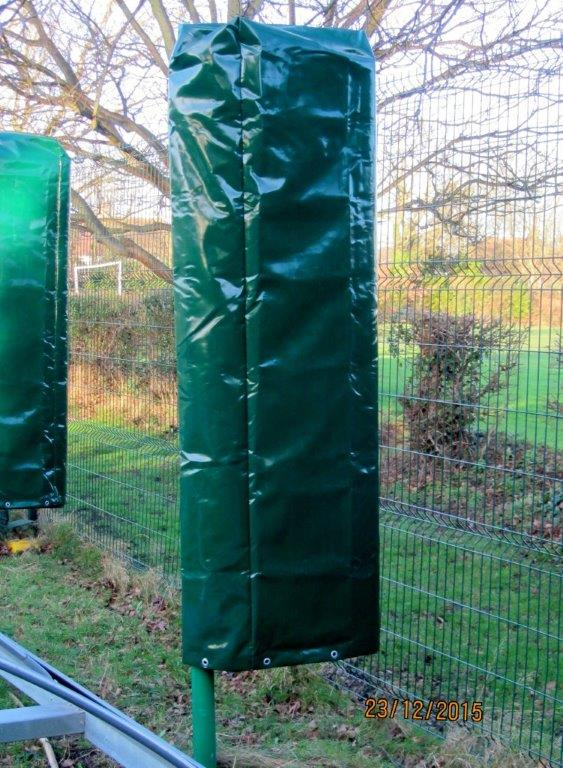 A Radford™ Ezy Net™ surface can match required critical fall heights. The Radford™ Ezy Net™ playground matting solution is a highly cost effective and easily installed way of protecting children from danger in areas of high risk. 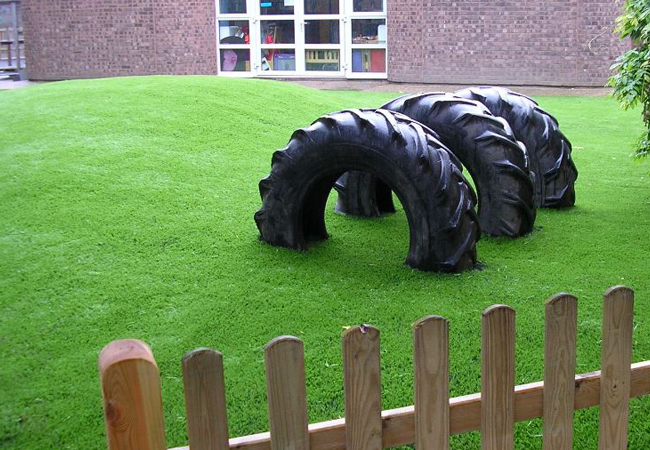 Playground matting was developed after years of research and has undergone an extensive testing programme to ensure compliance with the exacting standards of the British Standards Institute. The Radford™ Ezy Net™ playground matting surface is fire retarding and slip resistant even when wet, while at the same time serving as a load distributor and insulator against low temperatures. Leisure Grass is a synthetic surface grass which looks very similar to the real thing but requires little to no maintenance. It is perfect for use in home gardens, pub gardens and is even used by councils on roundabouts and other public areas. This innovative product is quick and easy to install, extremely durable and many of our customers comment on how well it lasts year after year.